We do have those red flickering scenes in To the Moon and you can hear birds when there are none at several occasions - Neil even comments on that in once scene at NASA. Besides the obvious thing of Eva seeing another Eva on the street and Neil somehow shutting down the power when he couldn't have been there, there are some other interesting observations I made in minisode 2 that hint strongly in that direction. I listed them up in another thread. Assuming this is somebodies memories and everything we see has already happened, it would be plausible for Faye to appear before she's even captured because it would basically be a future Faye. Still all that evidence in addition to what bobbybrickson noticed bring me back to my initial statement that all this is somehow not real but inception style nested stuff. Yep, we're at the point where there's way too many hints to think otherwise, but not enough to get a good enough idea of what's going on...Can't wait for an eventual resolution, whatever it may be. I'm minded to think of the 'mutually beneficial deal' Neil discusses (given one branch of the combat) with Faye. FAYE: "Uh-huh, and what do you want?" FAYE: "I thought we went over that already." NEIL: "Sure...But now I have something to offer you in return." FAYE: "What can you possibly offer me...?" NEIL: "Something mutually beneficial, actually. And even if you don't care for it... I have a feeling that Colin would." Seems to me that the whole point is Neil needed to offer a sweetener -- something that wasn't Faye agreeing to stand down and allow them to carry out their job with Colin. I doubt we have good reason to think Colin would like the idea of Faye becoming a machine's AI qua AI, but Colin would like the idea of Faye acquiring an independent existence of her own, i.e. persisting past Colin's death. But assume that Neil really offered Faye an uploaded existence--rather than working for him as the machine's AI. Where would Faye go? What environment could Neil--ethically, or at least, with a minimum of legal difficulties--offer Faye? I submit it would have to be memories he has ready access to, namely his own, and possibly, Eva's. I'm not arguing that we mightn't have independent reason to think memories are being altered. But I don't think the information we have now entails such a strong conclusion. Keep in mind that as mentioned in TTM, the *basic* machine cannot alter memories without rewriting an entire life. Most-Recent-Johnny-Copy already asks Neil why they can't just send him to the moon, where Neil explains he's just an imperfect 'Read Only' copy of the original. In addition, memories can be reset. Certainly, Neil's machine might have lost this safeguard, but if it did, it would have to be in the future, or any early interactions Neil and Eva had with Colin's memories would have already changed things. So even if Faye is running around in what is essentially a memory-recording and changing things, it's hard to say whether the actual, original memory is being changed, much less anything that is Neil or Eva themselves, rather than Read Only copies. Oh, when I said that this was Inception style stuff I meant that large portions of the game are actually not about changing Johnnys or Colins memories but about Neils and Evas (if your idea checks out) memories of having changed the memories of Johnny and Colin. So in essence they'd be in a second layer of memories (memories of memories). This does in no way contradict or invalidate any of the ideas you just mentioned. Actually if it were possible to merge two or more persons memory records to get one more detailed record, that would neatly solve the dilemma of how it's possible to see both scenes only involving Neil or Eva. I'm not sure we know 'who' is in the second layer of memories either, though, especially if the appearance change mechanism remains so Faye could look just like Neil or Eva. But I definitely agree it seems that the 'world' we get to see isn't fundamental or bedrock. 1. 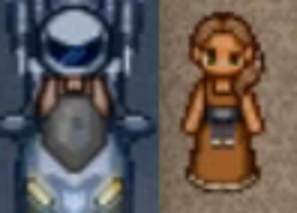 "If you recall the moment Neil sees "Faye" driving away on the motorcycle, he's initially shocked but then a quick flash of white accompanied with a "bleep" sound occurs and he quickly changes his composure and train of thought. This makes it seem like his memories are potentially being altered or fixed." The issue with this though is that it doesn't show memories are being altered or fixed per se, though I grant 'potentially' is a weaker claim. We see the flash and the sound effect being generally associated with a memory being 'reset', and in fact, Neil's (and in Minisode 2, Eva's) behaviour makes the reset seem plausible. But resetting a memory is a far cry from actually altering it, as Neil's explanation to Johnny in TTM establishes. Does it go some way in establishing that this is a memory? Sure. But it's a leap to say that the memory itself is being altered. Reset-based or interactivity-based alterations to memories are temporary at best; otherwise Colin would have weird memories of a floating desk in class, among other things. 2. One thought that lately occurred to me is that if the episodes thus far have been memories, then there's one discrepancy between them and actual memories: shadow-people. This is not an insurmountable objection. Neil's machine might have a way of extrapolating, or at least just randomly generating faces for shadow-people in order to increase immersion. And certainly, it seems like the presence of the shadow-people (i.e. the poorly-remembered faces) don't detract from how convincing an alternate life is, at the end. So maybe patients don't actually notice this, anyway. Or maybe Neil or Eva or whoever's memories these are has an eidetic memory. But it's at least a curious point that we haven't even seen a single poorly-remembered face/shadow-person thus far. Maybe it tells us something about how the machine works. I share you guys's thought as well. The game never showed us what Neil offers to Faye to get the last memory orb, but I think that's when he offers Faye a place to stay or a chance for Faye to exist in some ways. So, I speculate that Faye and Neil must have some relationship that hasn't been revealed to us in the game. One sentence that bugs me though "I think all our memories, and everything in it can be nothing but the fiction we tell ourselves." Does that implies something about the Inception theory? I can only wonder. Dammit, Kan. You really blown my mind. "One sentence that bugs me though "I think all our memories, and everything in it can be nothing but the fiction we tell ourselves." Does that implies something about the Inception theory? I can only wonder." Possibly. That being said, it's a statement that actually makes a decent amount of sense (as far as I'm aware; I'm a bit backdated on the literature) given the contemporary literature on narrative identity, which basically suggests that we (our sense of self) is the product of a narrative/story we tell ourselves. Memory isn't infallible; it doesn't preserve. Some of the literature argues that we aren't so much recalling things as generating things. In that sense, memory is like story-telling. It's how we make sense of the past, and feeds into the story we're telling of ourselves. So, I'm extremely fond of that quote because it's deflationary: it's not as if some memories are 'more real' than others or 'less real' than others. In the big picture, it's all about sense-making. Disclaimer: I concede to any people working in psych or cognitive science. My field isn't psych or cog sci, though we often have to keep up on the contemporary literature from those fields. Any mistakes are my own. Eye-witness evidence tends to has the least weight in proving things. People have a thing called "False Memory" and there are many research paper regarding this topic. We, human, tends to see the things in the way we want, even with our own eyes. Especially for this story, which happens inside a man's head. In keeping with much of what has previously been posted. I think Neil is looking for a way to self edit or at least self observe memories. Fay provides a way to do that, even if its a little abstracted. She is an aspect of the subject themselves though more of a subconscious than conscious agent. If you were to just go into your own memories with a version of Fay that is based on yourself, you could, hypothetically edit your own memories without the need of other parties. This is obv great bc it makes the sigmund corp stuff more widely available, which is why the other characters are down with Neil's experimentation. Wow. I had totally not caught the subtle (not so subtle?) hints at Faye's presence in the "real" world on my play-through, but it totally checks out. I wonder if Neil was going to steal or wreck the motorcycle if Faye hadn't driven it off. He seems to notice it is odd that it is driven off by someone, but his follow-up comment is (something like), "That's a nice bike." The disjointed nature of the comment seems to confirm that there is something unnatural about the sequence of events. However, that comment coupled with his earlier looks at the bike make me wonder if Faye is preventing him from doing something stupid with the bike he would regret. It is interesting how Kan is setting up Eva as a character who is generally uninvolved in all of this meddling Neil is doing. She seems to make Neil's life better when she's around--in a similar way to how Faye might be making Neil's life better. If Neil handles the situation with the two girls, it's something he might regret (and Faye fixes it), but if Eva stops him, he doesn't have that regret in the first place. What popped into my head immediately (and I know it's dumb), is that they are editing their memories so they won't be fired. There are frequent mentions of other Sigmund Corp teams being better than Watts and Rosalene. Maybe they actually bungle most of their jobs and editing their memories of their mistakes is the only way to avoid hot water at work. It's kinda sad and funny how this can explain everything.